Approximately 500 women came downtown on Oct. 1st for our 12th Annual Girls’ Night Out sponsored by PT Main Street, Jefferson Healthcare, Ozone Socks and generous participating merchants. All 500 goody bags sold out on the day of the event! And the raffle tickets were popular too--congrats to the ticket holder who won the $700 raffle prize. The day started out with the new “Tiara Trot,” and 65 women came Tiara Trotting. 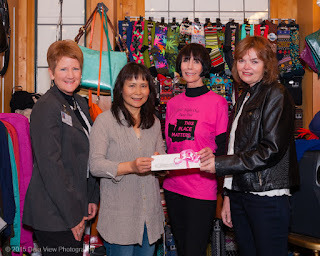 Thanks to all who supported Girls’ Night Out which raised over $3000 for Jefferson Healthcare screenings for women in need, and $3000 for our nonprofit Main Street Program. Thank you to The Belmont for hosting 90 women at the After Party--it was great fun! The food was incredible. The Clothes Horse was one of many of the generous merchants who donated to Girls' Night Out. So taking this photo at the store in front of the Ozone sock display was a perfect backdrop for the photo. Earlier this week I took this photo of Mari from PT Main Street displaying the check for $3000 that was given to Jefferson Healthcare here in Port Townsend. I'm looking forward to connecting with the winner of the raffle who won a photo session to my studio at Deja View Photography here in Port Townsend.